"The Lokey Event is still generating extremely positive buzz and you can take a great deal of the credit ! Your talent was evident from the moment you picked up your brush and partygoers loved watching the painting's creation. We loved spending time with you and thank you for imbusing th event with such flair. Delightful ! best describeds your aura." "Joan took my event from just great to TRULY MEMORABLE !! Our guests were fascinated by her work and watching the painting progress. It's not easy to impress the President of Mercedes Benz USA but as you can see in the photo, he too was fully engaged! We were fortunate to find Joan!!! " Kevin Cooney, Balance Marketing Group. "Joan, thank you for the most magnificent gift a couple could ask for. Your presence at our wedding added to the magical artistic woodland theme. The painting itself if a masterpiece and looks incredible in our apartment. Every time I look at it it reminds me of our magical day. Thank you for the painting that we will treasure forever ! " "Thanks so much – these are lovely! You’re the best – talk to you soon." "Hi Joan, The painting looks great! You really captured the moment with all the people, flowers, band and the surroundings! We can truly identify all the people you painted and I know when Lauren and Steve return from Australia, they will be very pleased.Thanks again, "
- Anita Wessier, bride's mother. "Hi Joan, Steve and I just returned from our honeymoon. My mom picked us up and showed us the picture of the painting. It is absolutely stunning!!! I cannot believe how perfectly you captured the essence of everyone and everything. It definitely portrays our perfect night. too. 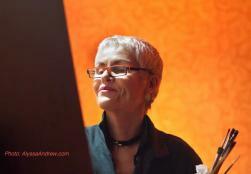 We loved watching you paint yesterday at Zachary's Bar Mitzvah. I can't wait to see their painting. It has been a pleasure working with you. I will pass your name on for sure." "They told me you were good, but I didn’t realize you were going to be this good." "How beautiful and special. They will have this forever." "I just wanted to say THANK YOU! 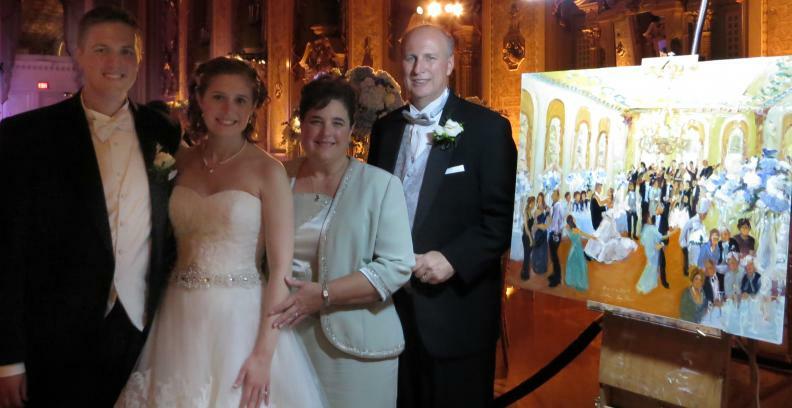 The painting is beautiful- really lovely- you totally captured the ceremony! Rachel and Lee love it and are so happy. Many many people were asking me about what you do. Thanks again for being so accommodating. It was a pleasure working with you.. So thanks again! The painting is so impressive, and it is going to be something Rachel and Lee cherish forever!" 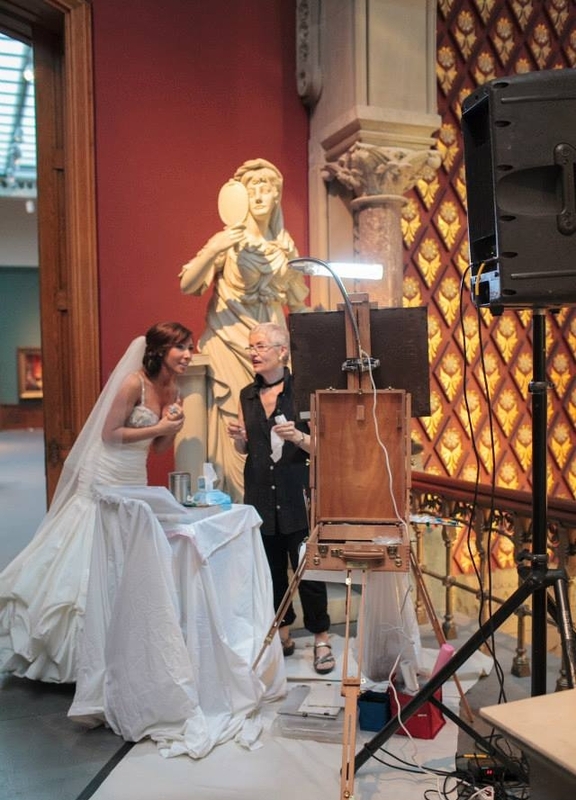 "I had a wedding painter at my wedding and it was one of the best aspects of the whole day. She was set up right at the end of the aisle and really fit into the whole ambience (ground floor of an old mill, baroque chamber group playing, soft uplighting, the sound of running water in the background). She painted the scene while we were saying our vows. Her style is fairly abstract which I love because it really captures the colors and mood of the moment and you can still definitely tell who is who. It's the single thing that I got the most comments about. Guests loved it. She painted away the whole night. Plus Joan is a fantastic lady and really fun to have around."